Astronaut Vanilla Ice Cream Sandwich - spacekids - space toys, dressing up costumes, kids spacesuits, astronaut food, cool space stuff! 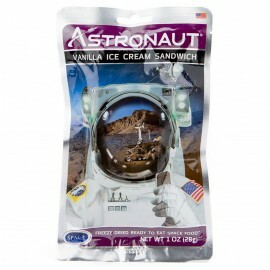 Enjoy your ice cream just as the Astronauts do - the freeze-dried way! 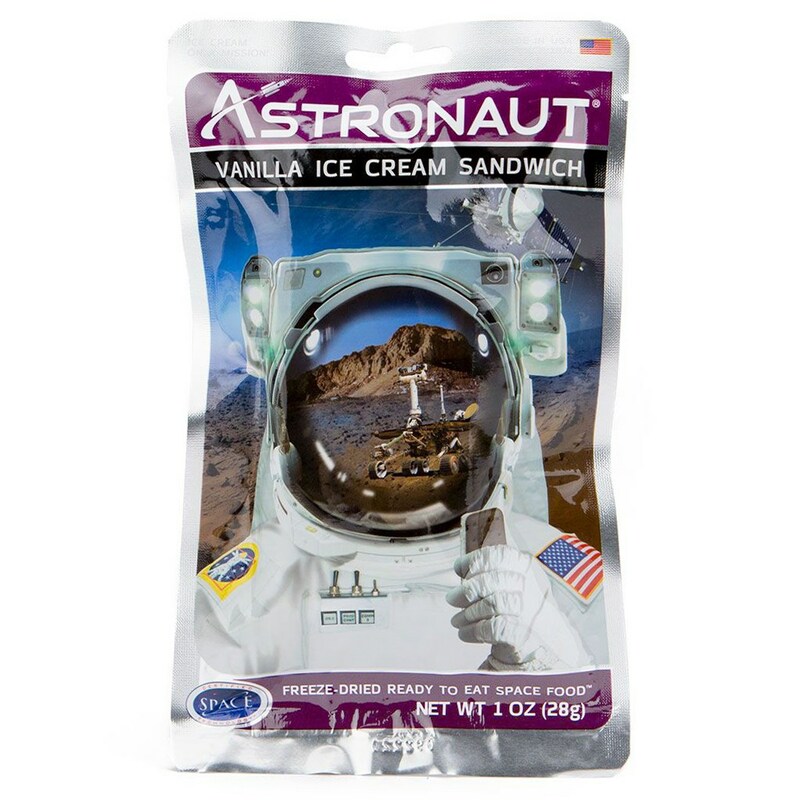 Astronaut Ice Cream®, as well as other freeze-dried food items, have been aboard space missions since the early Mercury Missions. They continue to be used on NASA missions today. How does it Look and Taste? Freeze-drying is like suspended animation because it keeps the ice cream sandwich totally intact, but without the water. As you eat the sandwich, your mouth rehydrates the ice cream, restoring it to its original state. Amazingly the ice cream sandwich looks and tastes just like the original. Freeze-dried ice cream sandwiches can be stored for many years without refrigeration as long as you keep them in an airtight, sealed container. Ideal as a snack, ready to eat. Ice Cream; Milk Fat, Sugar, Non Fat Milk, Corn Syrup, Whey, Stabilized and Emulsified by Mono and Diglycerides, Guar Gum, Cellulose Gum and Carageenan, Artifical Flavour and Vegetable Annatto Color. WAFER: Bleached Wheat Flour, Sugar, Caramel Color, Corn Syrup, Vegetable Shortening (Partially Hydrogenated Oils, Soybean, Cotton Seed), Corn Flour, Corn Syrup, Cocoa, Modified Corn Starch, Salt, Baking Soda, Mono and Diglycerides, Soy Lecithin. Please note that the freeze-drying process can sometimes cause crumbling of the product.